The painting of a wine bottle in wicker with sheet-music was not only a study in trompe l�oeil, but it was also a copy after a television demonstration by Helen Van Wyk. I must give Helen Van Wyk credit for more than just this painting because I have learned a great deal from her (in addition to my own mother, who is also a painter). 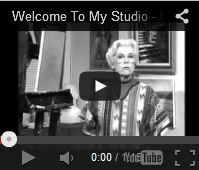 In the process of reading Helen Van Wyk�s books and viewing her videos, I have had much to think about. (No matter what your approach to representational painting, there is always a great deal to think about and to consider.) The composition and arrangement of the bottle on sheet music is a typical student type trompe l�oeil. I have also seen similar paintings done with corn pinned to a wall. I did not change the composition from Van Wyk�s except for reversing the image as I painted through a mirror in order to see her as a right-hander. 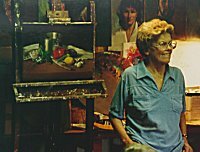 I would recommend that anyone seriously interested in oil or acrylic painting might consider studying at least the first five or six series (13 shows each) of Helen Van Wyk videos, in addition to reading her books. 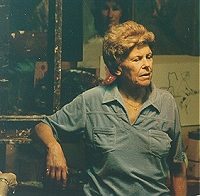 She died in 1994 of cancer, but she had done a great deal as an art teacher. I am certain that she had a secret life, not as an art teacher and demonstrater but as a real painter. There are probably other very good instructors, but I am not familiar with any that have a large quantity of both books and videos available. Sometimes in order to learn, it helps to produce such a study; however, we must not give up hope in being ourselves or being original. Study, study, study, and then apply yourself, your own identity, and your own interpretation to what you know and have learned. Don�t just emulate someone else. Make what they know, your understanding through a sense of appreciation. © 1998 John Gusty - This article was reprinted with the permission from the author.